Page available since 3/28/2009 - last updated 1/7/2013. The information below was thoughtfully provided by Barbara's husband Bill Robinson on March 27, 2009. Texas Woman's University has a summary for Barbara's WASP history and maintains a 2003 interview of her in their official WASP archives. Barbara Manchester earned her Private Pilot license in the Civilian Pilot Training Program in the fall of 1941, before Pearl Harbor, while a sophomore at Russell Sage College in Troy, NY. After Pearl Harbor she was determined to get her Commercial Pilot license so she could help the War effort by instructing pilots. She got the 200 hours and the license in the fall of 1942. In March, 1943 she got a telegram from Jacqueline Cochran offering a position as a pilot in the newly formed WomenÕs Auxiliary Ferry Squadron, to release male pilots for combat duty. She was interviewed and accepted and told to finish college and then take an Army Physical exam, which she did in July of 1943. She then got orders to report to Avenger Field, Sweetwater, TX on 5 August 1943. From August 1943 to February 1944 she underwent further Regular Army flying training graduating 12 February 1944 in WASP class 44-W-1, at the top of her class in Instrument flying and earned the treasured Instrument, Green Card. 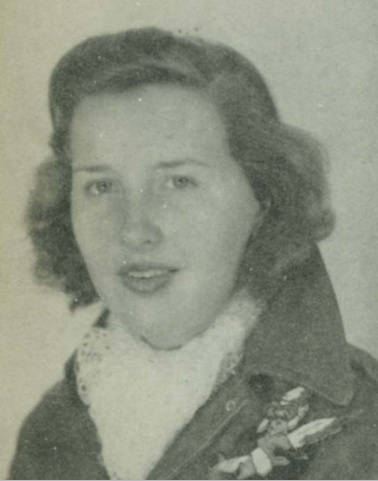 She was assigned to the Headquarters of the Army Weather Wing at Ashville, NC and flew officers to and from Washington, DC on official business, most often using an A-24 Dive Bomber with the passenger riding in the rear cockpit. With more passengers she flew a UC-78. The weather wing had been dispersed to Ashville as part of the effort to decentralize critical agencies from Washington for safety from possible enemy action. In May 1944 she was transferred to Kansas City, MO the Headquarters of the 23rd Weather Region where she flew as staff pilot for the Commander. This duty required flying him to his inspections at each of 33 weather stations between KC and Colorado Springs, CO every month. She flew him in a UC-78 for a couple months and then was given a C-45, (Twin Beech). During her tour there she attended OCS in preparation for the expected commissioning of the WASP. The WASP were disbanded on 20 December 1944. At that time she had logged about 2500 hours of flying time. The WASP were finally recognized as having been in the Army Air Force for their duty during WW II and were awarded Honorable Discharges in 1979. Barbara is entitled to wear the American Campaign Medal and the World War II Victory Medal. She has not flown as a pilot since WW II. She married William Robinson in May 1945 and they have five children, 4 of whom have served in the U.S. Navy. Duty; Flying the CO in UC-78 and C-45 inspecting 33 WX stations monthly, from KC to Colorado Springs. The CO slept from wheels-up to prop change on down-wind leg on every trip from the second one to the last in December 1944. The Colonel changed his schedule in June 1944 to let Barbara meet Lt. Bill Robinson at Lincoln, NE AAF Base and they got engaged there. (Bills B-24 Bomb Group was on the way overseas to the Western Pacific). Barbara attended Officer Training School at Orlando, Florida in July 1944. The WASP were disbanded 20 Dec.1944. Barbara had logged about 2500 hrs, which is about the same as Bill had logged after 40 missions. Neither has flown as pilot since WW II. Footnote: Bold items above highlight major differences between WASP and A/C training with much more instrument, X/C, and obvious navigation training given the WASP. Cadet check rides were every 30 hrs, while WASP were every 10 hrs. Barbara and Bill Robinson (as an Aviation Cadet), were in flight training at the same time, compared notes of their training in letters, from which came the details above.